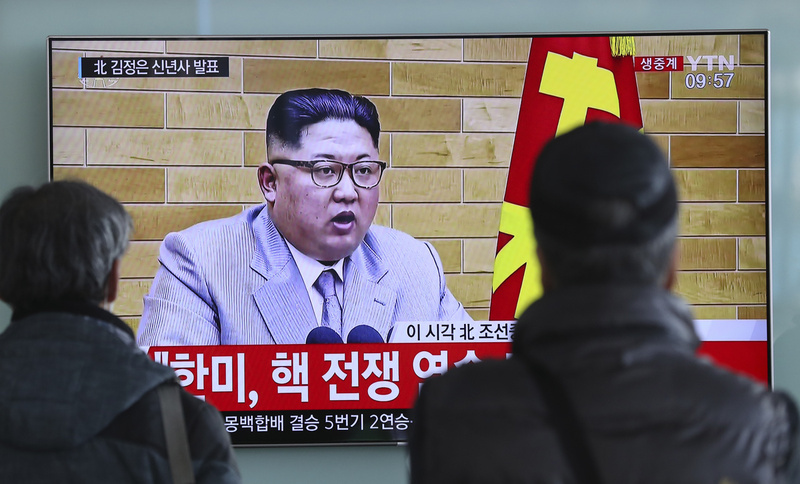 Kim Jong Un Wants The U.S. To Know That His Nuclear Arsenal Is Complete : The Two-Way In his annual New Year's address, North Korea's leader said his country had completed its nuclear weapons and that the "entire area of the U.S. mainland is within our nuclear strike range." South Koreans watch North Korean leader Kim Jong Un's televised New Year's address, at the Seoul Railway Station on Monday. Kim said the United States should be aware that his country's nuclear forces are now a reality, not a threat. His threats follow a year marked by frequent missile launches and a nuclear test that fueled heated exchanges between him and President Trump. But Kim said in his New Year speech that nuclear powers will not be used unless the North is provoked. "This year we should focus on mass producing nuclear warheads and ballistic missiles for operational deployment," Kim added. "These weapons will be used only if our security is threatened." Kim's hostile comments were offset by a diplomatic message. In his address, he also called for warming relations with South Korea. He said the 2018 Winter Olympics in Pyeongchang would be a "good opportunity" to present a more united Korean nation. "The Winter Olympic games that will be held soon in the South will be a good opportunity to display the status of the Korean nation and we sincerely wish that the event will be held with good results," he said.